We have just found out that getting to Walt Disney World from the Megabus stop in Orlando is about to get easier! Beginning July 1, 2012, the new stop will be directly inside the LYNX station. Skip on down to "From Lynx to WDW" below for information on getting to WDW from the current Megabus stop or the new one. 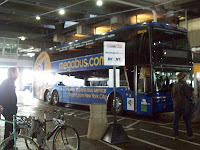 To find out how far the downtown Megabus stop is from Orlando transportation (LYNX) I contacted the Travel Orlando; The official source for Orlando Travel Planning. The travel bureau has an online chat that was partially helpful. The following is a cut and paste of my conversation from May 23, 2012. Debbie: Thank you for contacting Visit Orlando. How may I assist you today? Gayle: I'm planning a trip to Orlando via Megabus. Gayle: W. Jefferson St. Parking lot between North Garland and North Gertrude St.
Debbie: The public bus is LYNX, you may have to transfer on the way. Gayle: How can I find out where a LYNX stop is in relation to the parking lot Megabus stop? Gayle: Is the W. Jefferson Parking Lot downtown? Gayle: I'm trying to figure out if the Megabus stop is close enough to walk or if I need a cab. Gayle: I don't see anything on Megabus, on your site or (now looking) at LYNX that can tell me. Debbie: do you want the phone number for LYNX? Gayle: That would be amazing. Gayle: Thank you again for all of your help. I really appreciate it. Debbie: Thank you for contacting Visit Orlando. Please contact us at anytime. My next move was to call LYNX and hope they could tell me how to get to Disney from the Megabus stop in Orlando. I spoke with a very helpful representative named Calvin. He said that the Megabus stop is two blocks from the main LYNX terminal. North on Garland in the direction of traffic to get to the terminal. From Downtown Disney, go to the other side of Cirque de Soleil and look for the line of Disney Transportation buses. Depending on which bus you need, you can either go to the resorts or to the Ticket and Transportation center. Reverse the process to get back to the Megabus stop in downtown Orlando. This sounds simple enough but I won't get to Disney to try it until late summer. If you take the route, please come back to leave a comment in the section below. All of us would love to know how it goes. I will be taking the megabus trip from Atlanta to Orlando with my family towards the end of July. Does anyone know if it is a long two blocks from the parking lot to Lynx, the saftey of the area. Or the cost of a cab from the parking lot to Downtown Disney. none of this will matter in a few days (early June), as Megabus is moving IN to the LYNX station. Deal was just approved and you will not have to walk more than a few feet to hop the LYNX to DW. Good question on the taxi fare from LYNX to Downtown Disney. The Mears Transportation website estimates a fare of $48. I have no information on safety issues so far. The LYNX link indicates that taking the Fifty Bus should only be about $2.00 each person. The $48 is an estimate from Mears Transportation. They provide taxi service for the Orlando area. Depending on where you are staying at WDW that price could change. It was only an estimate. Otherwise, the other option would be to rent a car from Hertz or another company. I hope that this helps. If not, leave another comment or email me at youvebeenreviewed@gmail.com. Hello, I was hoping to get an update on your trip to Disney on Megabus since it is now in the Lynx station? I am traveling with small kids and was wondering if its worth it or should I just buckle down and rent a car once we arrive in Orlando? Like you, I am hopeful that someone will share their experience here. I heard by email that it went well for one person and their family but that one line is literally all they said. Illness prevented me from taking the trip we had scheduled. However; I have been to Downtown Disney several times. The buildings around Cirque de Soleil may initially block your view of the Disney buses but you'll probably be able to spot the attraction. Otherwise, it sounds pretty straightforward from Lynx. Hopefully someone will post. If not, please consider returning and chiming in. It sounds like a great trip!